The 3rd annual GigaZone Gaming Championship was held Saturday, October 20 at the Sanford Center George W. Neilson Convention Center. The event featured free gaming on various console and arcade games, numerous tournaments, virtual reality, door prizes, and more. ISSA Team from Bemidji won the 2018 GigaZone Gaming Championship and $1,500 defeating the Iron Range Legends who won $900 for second place. The Shinob Squad took third place and $450. Northern Minnesota’s best Overwatch teams competed on the eSports stadium style stage in the GigaZone Championship Arena. In addition to the Overwatch 3v3 Community Tournament, there was several other open tournaments include Magic the Gathering Booster Drafts, Fortnite, Rocket League, Mario Kart 8, Madden 19, Super Smash Bros. (4), Super Smash Bros. Melee, Tron, Bust A Move, Galaga, and Asteroids. Admission was free and there were a lot of door prizes given away throughout the day and the Grand Prize winners were Michael Railsback of Bemidji winning the XBox One X and Jesse Waldo of Detroit Lakes winning the PS4 Pro. 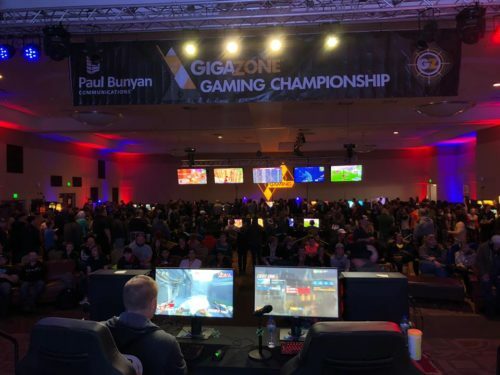 “There is a large gaming community in our area and GigaZone Gaming Championship not only showcases some of the region’s best gamers but it gives everyone a chance to get in on the action! It was awesome to see so many people from right here and all over come together!” said Gary Johnson, Paul Bunyan Communications CEO/General Manager. “There is no other gaming event like it anywhere I’ve seen. It’s unique to our area and we are very proud of our team for making it happen. We’re already looking forward to next year.” added Brian Bissonette, Paul Bunyan Communications Marketing Supervisor. This Paul Bunyan Communications event includes the talents of many local partners including NLFX, Accidently Cool Games, Northern Amusement, the Sanford Center as well support from regional and national partners.